I'm a little bit in awe at the magic that happens when you combine butter, flour and sugar. That's all it really takes to make these sweet, flaky biscuits - although I threw some leftover chocolate chips in, too, just because. On their own, they do an alright job - sweet sugar sprinkled over creamy porridge, or salty butter spread over hot toast are both pretty delicious, right? But when you combine them all together, they are so much more than the sum of their parts. That's the joy of baking; taking ingredients that are pretty ordinary on their own and whipping them up into something extraordinary. The same combination of ingredients, with a few simple tweaks to the way you treat them or what you add into the mix, can produce all manner of different, but equally delicious, things. Add an egg or two, and you have a light and fluffy sponge cake. Some cocoa powder or some icing sugar and you have a different set of biscuits entirely. Spread on some jam and cream, or grate in some lemon or orange, and that magic combination of butter, sugar and flour will show you what it can do. Beat together the butter and sugar until light and fluffy. Sift in the flour and mix until you have a soft dough. Stir in the chocolate chips so they're evenly distributed. (You might need a bit of elbow grease for this bit, as the dough is relatively stiff). Turn out onto a floured surface and use your hands to bring together into a ball. Gently roll out to 1cm-ish thickness and cut out into rounds using a pastry cutter. Bring together any leftover dough and repeat the process of rolling & cutting out until you've used it all. 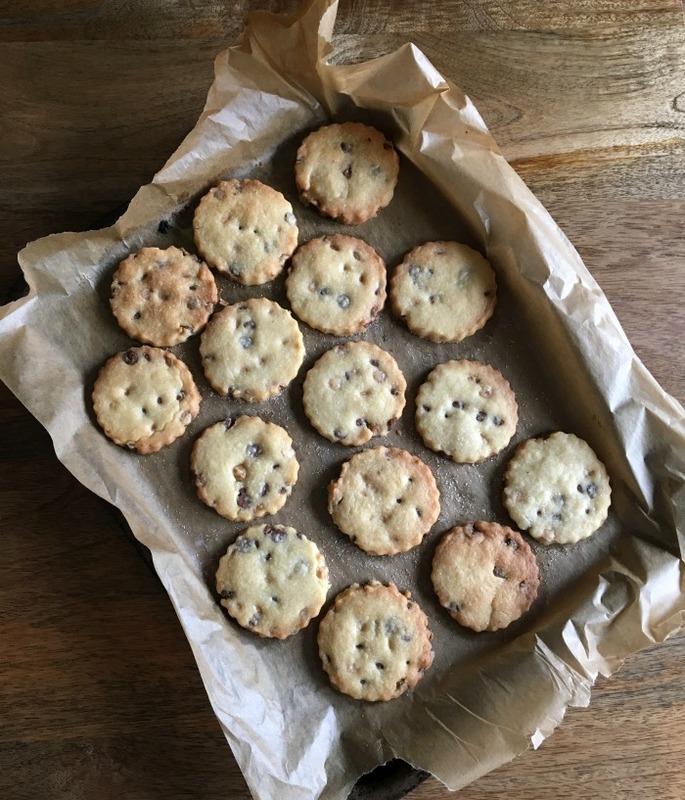 Place the biscuits on two baking trays, lined with greaseproof paper, and sprinkle with a little extra sugar. Pop in the fridge for 20 minutes to firm up. Meanwhile, preheat the oven to 190C. Remove the biscuits from the fridge and bake for 12-15 minutes until golden brown. Leave to cool on a wire rack.